When dentistry student Kellie Zelmer was preparing for the annual Table Clinics event last year, little did she know that her winning research poster on noise-induced hearing loss in dental education and dentistry would take her to Charlottetown, PEI, and Memphis, Tennessee, and lead to a country-spanning network of friends. When Kellie talked about this at home over the Christmas break, her sister, an audiologist, asked her if dentistry students wear hearing protection when they work (they did not) and told her that dentistry is one of top five careers for work-related hearing loss. After the holidays, Kellie spoke with faculty member Dr. Cynthia Andrews, who would be teaching a class on ergonomics and safety. 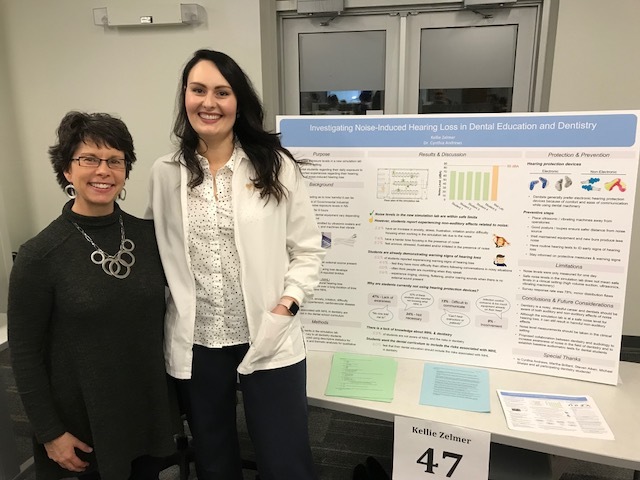 When asked whether the impact of noise would be covered in the classes (it was not part of the curriculum), Dr. Andrews suggested that Kellie research the topic for her Table Clinic poster in third year. Kellie’s winning poster presented noise level readings, examined the auditory risks of working in a dental clinic, and explored the measures that can be taken protect against exposure to noise. She also made the case for noise-induced hearing loss to be taught as part of the dental school curricula. Kellie claimed second prize at the conference and made friends with other dentistry students from across the country. And it was in PEI that their next meeting was planned. Before Kellie left for PEI, research officer Dr. Martha Brillant asked her if she would represent the Faculty with her poster at the Hinman Student Research Symposium in Memphis in November. She went off to Charlottetown without giving it much thought, but at the conference, Kellie asked her fellow students what they knew about the symposium and whether they were going. It turned out to be the perfect opportunity for them to reunite. 108 students from 56 dental schools attended the symposium and presented research posters, six of whom were Canadian. They stayed at the Peabody Hotel – the hotel in Memphis, Kellie explains – visited Graceland, and spent time site-seeing, all courtesy of the University of Tennessee. “If I hadn’t gone to PEI, I would never have met the students I ended up meeting again and spending time with in Memphis,” says Kellie. Now in the final stages of fourth year, Kellie already has a job lined up in her hometown at the Yarmouth Dental Group—working with all Dal grads. She says she loves the variety you get in general practice and has no plans to specialize. As for her research, she hopes to get it published and she would like to work with both the Faculty of Dentistry and the Department of Audiology at Dal to see noise-induced hearing loss on the dentistry curriculum and practical hearing loss prevention devices made available to those working in the dentistry learning environment.